Beautiful basket made for Tiara Exclusives, which are no longer in business. Indiana glass used various company's molds for the Tiara line, from Fenton, Duncan Miller, ect. 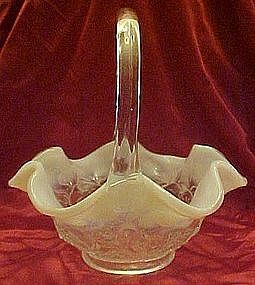 This is the 7 1/2" water lily basket in white lace crystal (opalescent).Perfect condition. A very beautiful basket!